Landscape: Lush greenery covering craggy peaks. Visited: Four times: February 11-15, 18-21, 23-28, and March 4-7, 2004. Also: Read about diving in Moorea. History: Moorea, meaning "offshoot" or "yellow lizard," depending on who you ask, has also been known through history as Aimeho (though Captain Cook spelled it Eimeo) and Fe'e (octopus). The "octopus" idea came from the ridges that today divide the island into eight segments. Captain Cook, the first main European influence of much of Polynesia, spent only a week in Moorea. Surprisingly, he anchored in Opunohu Bay and didn't even visit the one for which he is the namesake! This visit probably tainted the natives' view of Europeans, as he destroyed many canoes and houses when the islanders refused to return a stolen goat. At the time, Polynesians didn't have the western concept of 'ownership' (which would be an interesting way to live...). Pomare I of Tahiti conquered Moorea in 1792, with a little assistance from the Bounty mutineers - in the form of weapons. Sixteen years later, Pomare II began his exile on the island after he failed to bring all of Tahiti under his command. He was joined on Moorea by a party of English missionaries who, several years later, achieved a fifteen-year goal of theirs: Pomare II had finally been converted. 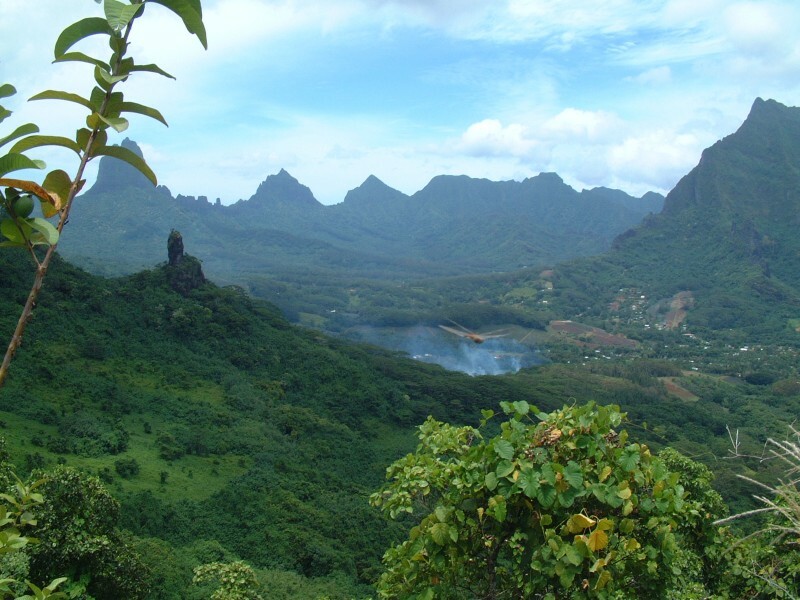 It won Moorea a special place in the history of Christianity. In 1815, the high priest of Oro accepted Protestantism openly and publicly, emphasizing his statement by burning the "heathen idols" at Papetoai. The whole population followed his example rather quickly. Pomare II eventually succeeded in re-conquering Tahiti. It was achieved with the assistance of the missionaries in 1815 - the true reason for his acceptance to being "converted." Moorea soon became just a backdrop for Tahiti, although a beautiful, plantation-covered one. 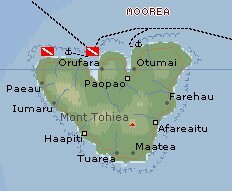 (Jon) Moorea was one of my favorites among the Society Islands, along with Huahine and Bora-Bora. The grandeur of the scenery, especially the 2 main bays, is awe-inspiring. It's populated just enough that we could get food, water and scuba fills easily, and recreation possibilities abounded. With Karen & Jon we rented bicycles and enjoyed a delightful 37 mile ride around the island. We visited spectacular viewpoints, saw some interesting archaeological sites, and took some delightful hikes through the interior. 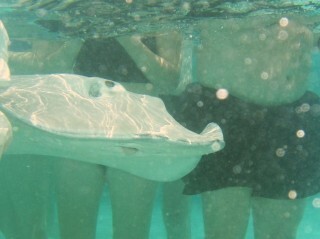 The most memorable events, however, were underwater. Moorea abounds in both scuba and snorkeling sites, with some spectacular scenery. Vince, Karen & Jon were very into scuba diving, so we often went twice a day, diving several sites both inside and outside the Moorea reef. We even found dive shops willing to fill our bottles for $5, about half the going rate in Tahiti. Bill & Mary aren't divers, but they love to go snorkeling. 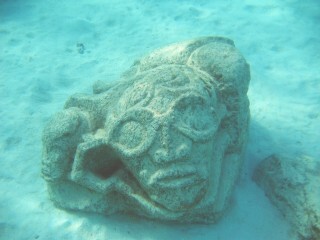 With them we found sunken carved Tiki stones and nice coral gardens to snorkel in. Stone Tikis are usually only made in the Marquesas - the Society Islanders usually carve their Tikis out of wood. These were apparently carved and put in the ocean to protest against the missionaries throwing the old wooden Tikis into the ocean years earlier. We also found where the stingrays like to congregate, just as they do in Grand Cayman. These rays behave almost like puppy dogs, nuzzling up to be fed. They can be quite insistent but they're not dangerous unless you step right on one, so shuffling feet is the best movement technique. They're about 3 feet (1m) across, with eyes are on top of their bodies and mouths on the bottom, which gets interesting. They come towards the fish in your hand, and turn on their "vacuum cleaner" mouths as they get close. Since they they can't see, they sometimes miss your hand. If they get any other part of you, their vacuum is strong enough to give you a "hicky". Feeding and stroking them is fun once you get used to it, but it can be a little overwhelming until then, especially as there was quite a current running. (Amanda) Moorea I mainly remember as our base for a heck of a lot of diving. I hardly went ashore at all, except when Bill & Mary were onboard and Mom, Dad, and I took a LONG hike down from the viewpoint that they had driven us up to. But it was really a good break from big-city Papeete and all the marinas and the big, full anchorage. Most of the time, we were the only boat in the anchorage - except for the constant tourist/dive boats and pirogues that went by every day. The diving was okay, though you had to choose between deep, murky, current, swell, or sharks. Or shark-suckers, depending. I only did one dive, and chose the murky but no current, surge, or sharks. I go through air fast enough as is, I don't need to start hyperventilating, thank you! (Sue) Moorea was a lovely surprise after the hustle and bustle of Tahiti. Walking the roads between big hotel resorts we passed small homes with colorful gardens festooned with flowers and fruit trees. Public transport is less frequent then on Tahiti, but still allowed us to cover half the island in a few minutes to begin a cross-island hike (8 hours!) with our friends Karen & Jon. Moorea underwater was superb, and the scenery, when we poked our heads up, was sublime. Although many cruising boats speak of anchoring deep inside both Cook's and Opunohu Bays, I loved being anchored in 10 to 15 feet of aqua water over sand banks at the mouths of the bays. This gave us great views of the shoreline and majestic volcanic hills. (Chris) After Tahiti, Moorea seemed beautifully empty. No cities, even relatively small ones like Papeete. Lots of trees, especially around the water, and very little development. Of course, I didn't see much of the island, just the area around the anchorage. Moorea does have a small airport, for example. However, I got an overall impression of a mostly untouched island. Most of my memories of Moorea have to do with snorkeling or diving. Tahiti had wrecks, but Moorea had interesting reef, which is in many ways better. There was a lot more underwater exploring in Moorea. Moorea also had sharks, stingrays, eels, and other large and rarely seen animals.